Your video and photographic equipment isn't your business, it's part of your livelihood. You can insure that livelihood under extensive insurance program offered to videographers and photographers. Coverage written on full 'replacement cost' basis. Loss due to theft (including theft from a locked vehicle), fire, vandalism, breakage. Leased and rented equipment, along with newly acquired equipment, subject to policy terms and conditions. 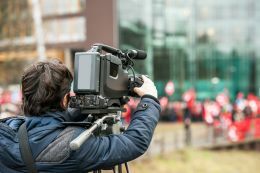 Make no mistake about it, videographers and digital imagers without professional liability coverage are taking serious risk. Other Mistakes that could lead to a contract dispute. What's more, our competitively-priced package can help cover court costs, attorney fees and other expenses should your customer pursue legal action. Best of all, E&O coverage insures not only you, but also the employees and independent contractors who work for you. At Buell Insurance, we've worked with businesses like yours for more than 20 years, maintaining a strong relationship with videographers and photgraphers. Identifying your industry's unique needs, we're able to offer customized coverages to videographers, from a national carrier with more than 100 years of experience and an “A” rating for financial strength. * Coverage currently not available in all states. Claim service is fast and fair with local claims offices throughout the country. Quotations are available with in 24-48 hours in most cases, upon reciept of completed application. Complete the on-line application.